The trolley wrapped by SDSU. Courtesy SDSU Media Relations. 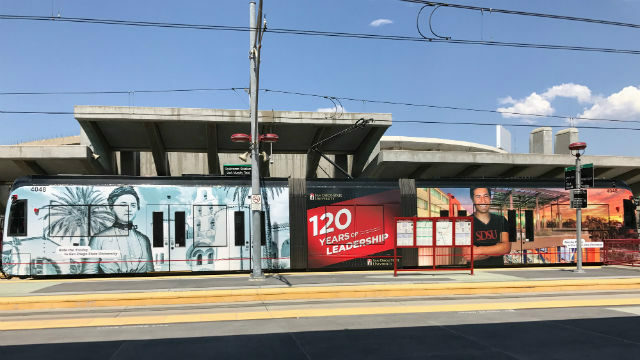 San Diego State University unveiled a newly wrapped San Diego trolley last week to help mark the school’s 120th year. The university was founded in 1897 as a teacher training school. Hundreds of thousands of students have received degrees from SDSU since the first graduating class of 23 women and three men. The university now ranks as one of the region’s largest economic engines, employing nearly 6,000 faculty, staff, researchers and graduate students. The new SDSU trolley also carries a “ONE CITY. ONE TEAM” design on the opposite side—a reference to the Aztecs’ new status as San Diego’s primary football team in the wake of the Charger’s move to Los Angeles. “SDSU’s positive impact on the San Diego region today is unmistakable—just as it has been throughout our 120-year history,” said SDSU Athletic Director John David Wicker.